Home Africa World news Douala: Normal woman suddenly runs mad in Public. 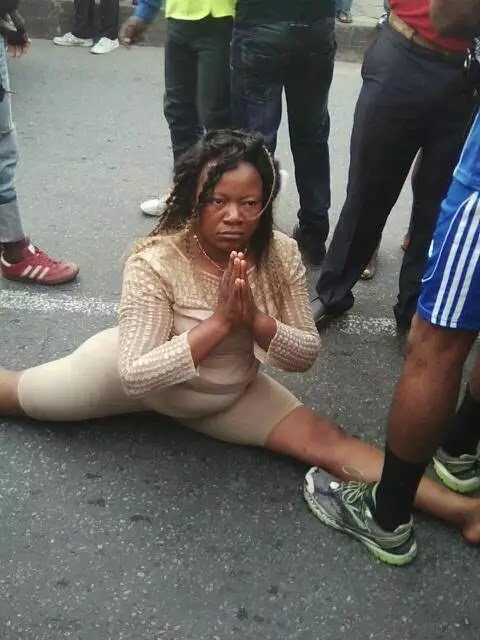 Douala: Normal woman suddenly runs mad in Public. The public is taken unawares as well dressed normal looking woman goes mad in the middle of the streets, in broad day light. Pedestrians and motorists on the streets of Douala, Cameroun were shocked when the woman parked her Prado jeep, stepped out of her car and walked to the middle of the street. She soon began a ridiculous display that left no doubt in anyone's mind that the lady had lost her mind. She showed off some remarkable flexibility. 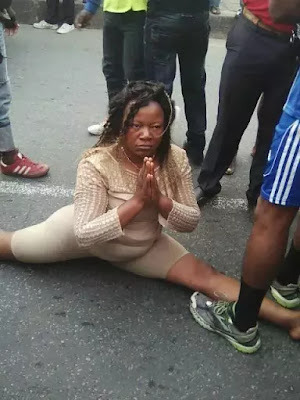 The crazy woman executed unbelievable leg splits that would have made Hollywood martial arts actor Van Damme envious. She also displayed dramatic antics that caused traffic to halt. But when she eventually tried to take her clothes off, she was subdued by the public and taken away by security officials. Her identify unknown, no one could explain what could have occurred to cause such a normal, healthy looking woman to lose it right in the streets of Douala, Cameroun's largest city. What do you think her story is? If you know the facts, please let us know.